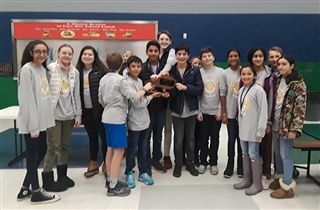 Congratulations to the Middle School Governor’s Cup team, who claimed their sixth straight district title at the tournament at Saint Mary Academy on January 19. KCD’s Future Problem Solving team won their fourth consecutive district title, while our Quick Recall team picked up their third straight district win. Eighth grader Riley Jones won her third straight district title in Arts & Humanities. The students listed below placed in the top five for their event and will move on to the regional tournament on February 2.